Sometimes single moments can change not just the direction of a game, but of a whole season. And that could prove to be exactly what happened in Moscow on Friday night, when Nick Calathes launched an improbable shot from way beyond the three-point line with his team trailing by 2 in the dying seconds of the game. When the Panathinaikos OPAP Athens backcourt general released the shot, the chances of the ball dropping into the net looked extremely slim. If, as anyone freezing the action would have predicted, the ball had missed the target, it would have brought Panathinaikos’s three-game winning run to an end as host CSKA celebrated its eighth straight victory. It would also have left the Greek team’s playoffs dreams hanging by a thread, effectively two games behind Olympiacos Piraeus (due to the head to head advantage) with just four games to go. Instead, though, Calathes’s shot looped high into the air, crashed against the backboard and dropped straight through the hoop. With just 0.3 seconds left on the clock, CSKA had no time to do anything in response, and the victory – potentially a season-changing victory – was on the way home to Athens. 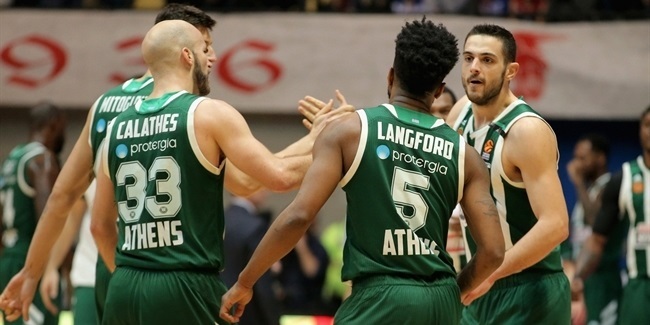 Now, thanks to that single moment, Panathinaikos can look forward to the remaining four games of the regular season with a great sense of optimism. Next week’s double round starts with a home game against fellow playoffs candidates KIROLBET Baskonia Vitoria Gasteiz, before a trip to face AX Armani Exchange Olimpia Milan. If both those games are won, Panathinaikos might not only be looking at reaching the playoffs, but maybe even finishing as high as sixth – and after this miracle in Moscow, there will be no lack of confidence among Rick Pitino’s men. 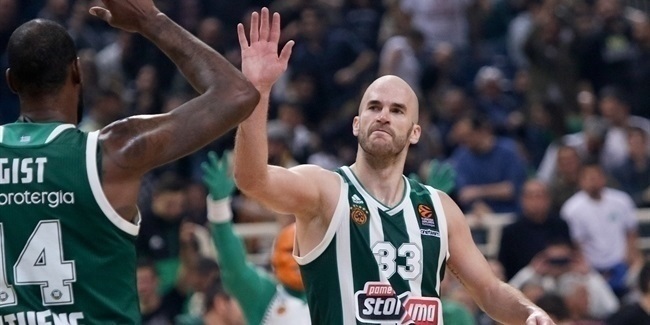 Various members of the Greek side were honest enough to admit that they benefitted from more than a small degree of fortune to see Calathes’s game-winner sail home, but Pitino also noted another key point when he addressed the media after the game. “We actually wanted to run a pick and roll and see what we could get out of it, but they left Nick wide open and I told him…look, get open and then bank the ball in from 35 feet!” he joked, before adding in a more serious manner: “Sometimes luck is an element and we got lucky with that shot, but we did all the right things to stay in the game.